Everyone who knows what burpees are has a very strong opinion of them -- and not always a positive one. A burpee is a calisthenic exercise that combines several simple movements, including a squat, push-up and jump, that use your bodyweight for resistance. They're designed to build endurance, so expect to run out of breath while you're performing this exercise. You may run out of strength, too, but if you persist, the calories burned (about 240 to 355 calories in 30 minutes) will be worth the effort. Plus, as a full-body exercise, you'll ton all your major muscle groups with a single exercise. Start by reaching both hands in the air over your head, and then come down into a squatting position. Reach your hands to the floor and kick your legs behind you, coming to the top of a push-up position, with your arms shoulder-width apart. Here you have the option of doing a full push-up before continuing. Jump your feet back to the squat position before pushing off your feet into an explosive leap with both hands directly above your head. Your weight, metabolism, duration and intensity are determining factors for the number of calories you'll burn while performing this exercise, but according to Harvard University, a 125-pound person can burn 240 calories in 30 minutes doing vigorous calisthenics, similar to burpees. Similarly, a 155-pound person can burn almost 300 calories in the same amount of time, while a 185-pound person burns 355 calories. How Do Burpee Measure Up to Other Exercises? While burpees do burn a lot of calories in a short amount of time, there are plenty of other exercises that do the same (or more). 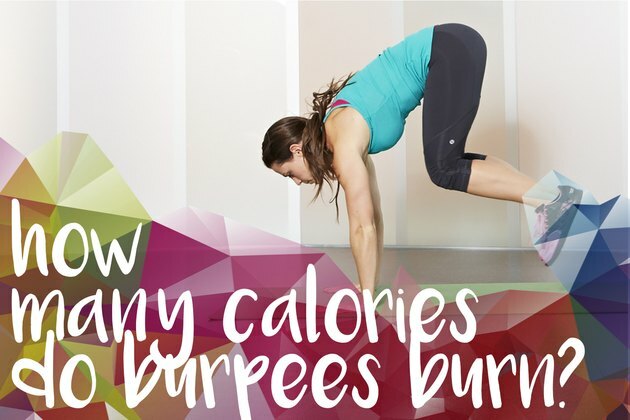 If you just can't stand burpees or are just curious to see how the calorie burn stacks up to other exercises, here's a list of similar exercises and how many calories they burn. *Based on a 155-pound person doing the activity for 30 minutes. Like many other body-weight exercises, there are a variety of variations you can add into your workout when you're bored with the standard burpee. Give some of these a try the next time you hit the gym. How Many Calories Do You Burn Doing Mountain Climbers?